One way the Foundation shares its space is by providing eight miles of trails available to walkers, bicyclists, and runners from dawn until dusk every day. The Lema Ranch trails – four miles on about 200 acres – are paved and showcase five ponds. 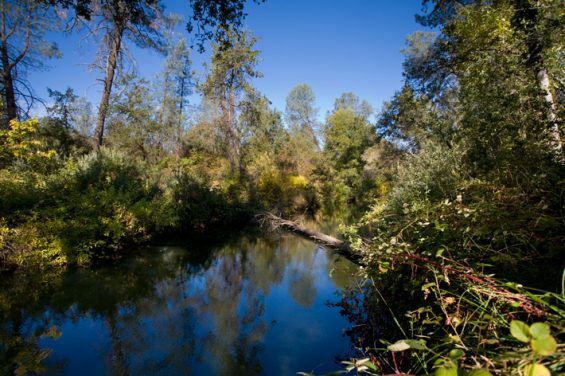 The ponds, built by the Lema family in the early nineteen-fifties, were enhanced in 1997 to encourage aquatic plant communities that provide wildlife habitat and improve the water quality. Biofilters – heavy plantings of aquatic plants intended to slow down and cleanse the water as it runs into the pond – were incorporated into the restoration of the ponds. 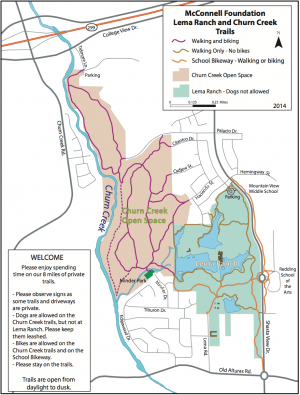 In order to preserve the natural serenity of the area, and to protect the many species of wildlife found on the trails, no dogs are allowed on the Lema Ranch trails and bicycles are only allowed on designated bikeways. 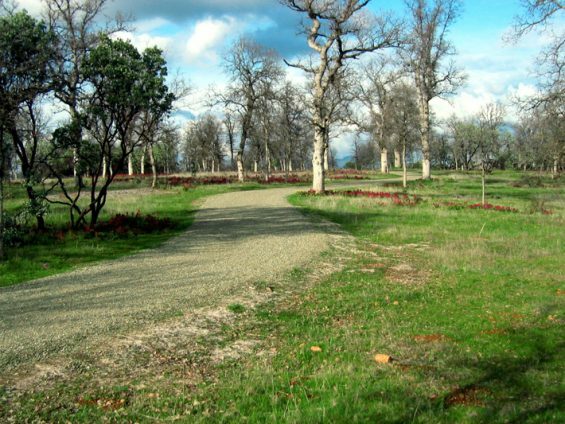 Those walking the Lema Ranch trails will notice a diversity of plants, from graceful weeping willows to manzanita, oak, pine trees, and native grasses. Many species of wildlife can be spotted by the careful observer, including ducks, red-winged blackbirds, egrets, woodpeckers, and many other birds. In the winter, otters and muskrats occasionally show themselves in the ponds. The local Audubon Society, Wintu Audubon, has compiled a checklist of birds observed on Lema Ranch. Many members contributed to this project, and the brochure was funded in part by North State Resources, Inc. It can be downloaded here as a PDF. The adjacent Churn Creek trails, winding through another 180 acres, cover another four miles, and are partially unpaved. Dogs (on leash) and bicycles are welcome on these trails. During the construction of these trails, the layout was based on maintaining views, protecting the watershed, and careful use of the open space. This section of Churn Creek, primarily an urban stream, is preserved in its more natural state. With the addition of these trails, previously disconnected neighborhoods were linked, allowing children to safely walk and bike to school, protected from vehicle traffic. Consideration was given to balancing the need to protect the wilderness and encouraging public use. The Churn Creek trails take walkers through a classic blue oak woodland, with manzanita and gray pine. Sections of the trail meander by Churn Creek itself, where the terrain is riparian, with willows, valley oak, western redbud, cottonwoods, and snowdrop bushes. One of the highest values in preserving the Churn Creek property as open space was maintaining the balance between the reality of the urban area and allowing people to connect with nature and experience the natural habitat. Surrounding this portion of Churn Creek with trails and open space prevents the stream from being channelized, allowing it to operate as a natural stream and preserving the woodlands around it. In the grasslands surrounding the Churn Creek trails, non-native and invasive annual grasses and herbs have largely outcompeted native grassland species. This is true for most grassland regions of California, where native species make up less than one percent of the standing grassland crop. Native perennial and annual grasses developed in conjunction with grazing herds of pronghorn antelope, elk, and deer. Herds browsed, grazed, and trampled the grass and Native Americans acted as stewards of these valued ecosystems. With managed cattle grazing, the Foundation can mimic the actions of the native herds that previously foraged the grasslands surrounding Churn Creek. 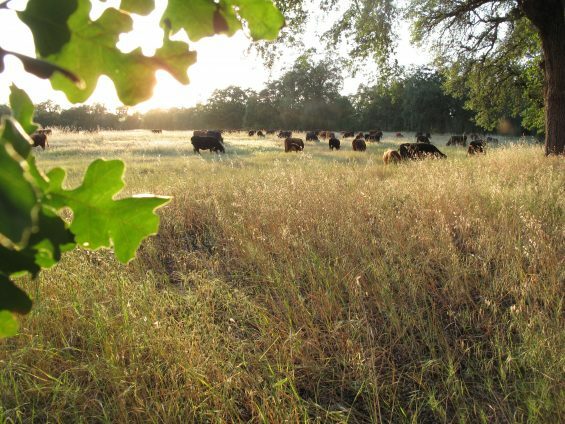 The cattle will help limit the growth of noxious weeds and facilitate the growth of native grasses and wildflowers. The rejuvenated soils will provide an ecosystem in which native flora and fauna can thrive. Annual spring grazing will also allow us to minimize the amount of herbicides, fuel, and intensive labor we need to keep our properties safe from forest fires. Every spring cows are rotated from pasture to pasture in the Churn Creek Greenway. Electric fencing surrounds the pastures at all times and interns from Shasta College assist in moving fencing and monitoring the cattle. Please email acarter@mcconnellfoundation.org with your questions.